Slow progress is still progress. At least that is what I am trying to convince myself right now. This has been an unbelievably slow start to the season, especially when making comparisons to last year. After looking back at our log book from last year, we continue to be every bit of 4-5 weeks behind. Although last year was certainly an anomaly when it comes to early springs, it’s still frustrating knowing that the weather is not cooperating at a time when everyone is ready to get out and enjoy the golf course. The weather is equally as frustrating for me as well. This is the time of year when we want to accomplish so many important agronomic tasks and we just can’t get to them right now. Spring fertilizer applications where they are needed, pre and post-emergent weed control and regular mowing schedules are all items we would like to get done, but we must show patience and wait for Mother Nature to tell us when the right time is. If you maintain your own lawn, this applies to you as well. See me if you have any questions. On the positive side, aerification of the greens, tees and fairways is complete and we have made our first of three applications to reduce seedheads on the greens. Notice I said “reduce”, not eliminate. This application will not keep all seedheads from forming, but help to minimize the amount of them. Historically, we have had very good results and my hope is that this year is no different. 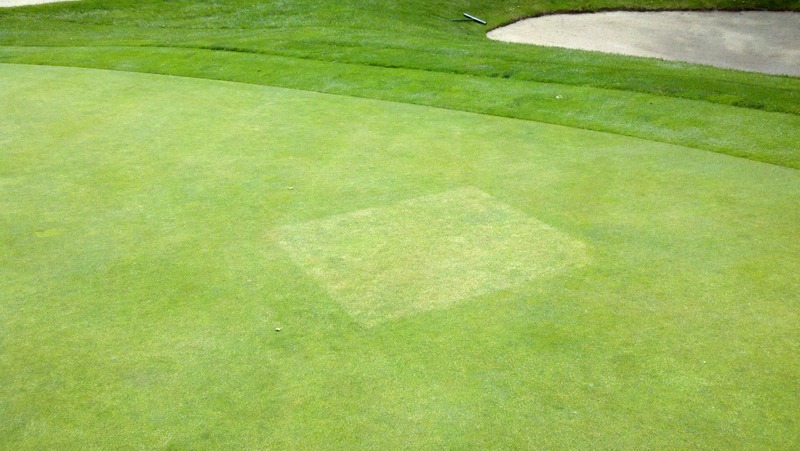 As in year’s past, I have placed several 4’x4’ check plots (untreated areas) on some of the greens to help me better judge the results we obtain from this application. If you would like more information on why we use check plots, look along the right side of this screen under “Popular Posts”. The third one is titled “What Can You Learn from 16 sq. ft.” and will give you a greater insight. 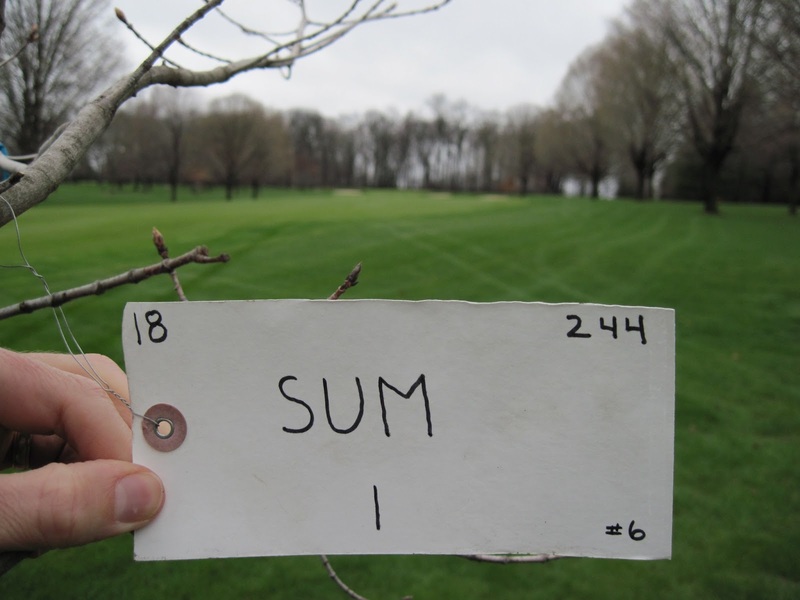 Several of you have asked me about the new, white labels on some of the trees on the golf course. These labels serve the same purpose as the colored ribbons that were put out last fall. They are simply there to help me identify trees that have been diagnosed with varying degrees of damage from the herbicide Imprelis. These labels DO NOT necessarily mean that the tree is going to die or need to be removed; they just make it easier for me to obtain information without having to constantly look them up in spreadsheets. To date, we have not finalized anything with DuPont as far as a settlement is concerned. As soon as we have the appropriate information, I will be sure to pass it along. With that being said, it’s spring so get out here and enjoy your club. Even if it’s a little cold and rainy outside, there are plenty of activities going on inside the club for you to take advantage of. I look forward to seeing all of you and have a great month. By now everyone is aware of the US20 expansion project that will be taking place from CR17 in Elkhart to SR15 in Bristol. Last week I attended pre-construction meeting to meet with individuals from INDOT as well as Niblock, the company awarded the project. Below, I have listed some of the main takeaway points from the meeting. · Expect to see work beginning sometime during this week. The Right-of-Way is scheduled to be staked and tree removal will begin. · The goal is to minimize any road closures of county roads connecting to US20, but some temporary and intermittent closures will be necessary. This includes CR21. There are no specific dates set for closures, so be prepared for this possibility if you use US20 and CR21 to travel to Elcona. · You should fully expect an increase in traffic along CR21 due to motorists wanting to use it as a short cut when traffic is slow on US20. Please use caution when coming in and out of the club and when crossing CR21 with a golf cart. · This project is not expected to be completed until the latter part of 2014. The south side of the expansion will be done in 2013 with the north side completed in 2014. · There will be minimal disruption to Elcona’s property. A few trees are expected to be removed at the intersection of CR21 and US20 but, beyond that, no other major removal is expected. Our fence along #2 and #15 will remain intact and the sign and landscaping along US20 should remain undisturbed.